As a former model and executive at Miramax Films, Mila Joura’s diet consisted of coffee, cigarettes, and airplane food. Worn down and exhausted, she left the runway and enlisted the help of nutritionist Oz Garcia to guide her back to the world of real food and healthy living. The two ended up partnering and Joura worked in the nutrition and wellness industry for a decade and a half, always keeping up with the latest revitalizing treatments and regimines. So it was love at first shiver when she first discovered cryotherapy, the use of very cold temperatures to help repair damaged tissue. Wanting to make the cool treatment accessible to everyone, she opened her own cryotherapy and vitamin-infusion center, the Fuel Stop. After our own Amanda Taylor stepped into the cryochamber herself, we wanted to know more about the urban “antispa.” We caught up with Joura to talk nitrogen-free cryochambers, what minus-235 degrees Fahrenheit feels like, and her favorite slice of pizza in New York City. What Should We Do?! : When was your first experience with cryotherapy? What was it like? Mila Joura: About four years ago [in 2013], I got introduced to cryotherapy. I started to do it in this nitrogen bucket; you stand in the bucket where nitrogen is pumped in at your legs, and your head is sticking out—it looks very cool, but it’s this very strange experience. The cold and the idea of going in minus-235 degrees Fahrenheit temperatures [for three minutes] was crazy, but it made me feel great. I was submerged in the cold, and I thought my body was going to break. But when I came out, I had this amazing, invigorating feeling. I felt energized, my brain was working great, my mood was elevated, and my body felt bionic. I had so many questions afterwards, like, “Why is my head sticking out?” and “Why am I not fully submerged in the bucket?” I learned that you’re not supposed to breathe nitrogen because you can faint, but I felt like my head needed to be submerged in the cold temperature, as well. So I was already starting to think about ways to make it a better experience. WSWD: So how did you improve on that original experience? Joura: It’s not a pleasant situation when you’re in minus-235 degree temperatures, holding your breath, with your lower body dumped in a nitrogen bucket, thinking to yourself: Am I going to faint? When I really got into cryotherapy. I went all over the world to see where they manufacture cryotherapy equipment. I went to Slovakia and Poland and saw where they make the nitrogen equipment. I knew, after research, that it was better for your whole body to be submerged and that nitrogen was not healthy. Finally, I found a company in Germany [that’s] the only one in the world that manufactures whole-body cryochambers. When I went there and saw the equipment, I said to myself, “This is the Rolls-Royce of cryotherapy.” I thought if I’m bringing cryotherapy to the U.S., this is what I’m going to bring. Now I’m the only one in the United States that has the electro-powered, whole-body, nitrogen-free chamber. Inside [a Fuel Stop cryochamber], you’re only breathing ambient air. The chambers are cooled down to minus-230 degrees. It is a room, so your whole body goes in, and it is the optimal way to experience cryotherapy. WSWD: What else motivated you to open the Fuel Stop? Joura: When I turned 50, I thought to myself: OK. I have two kids—my son is 10 and my daughter is 9—and my hands are full. I have no time to relax at a spa or go on a retreat or go for a massage, but I do need to take care of my body. I need to look good and feel good, and I can’t afford to get sick; I have two kids who I have to take care of. Also, I don’t want to live on coffee and I don’t want crazy amounts of plastic surgery. What could I do in a fast and sustainable way? So I kind of distilled every treatment and procedure that I’ve done in my career as a nutritionist and I came up with the Fuel Stop. I call it the urban antispa, because I don’t have time to go to a spa. 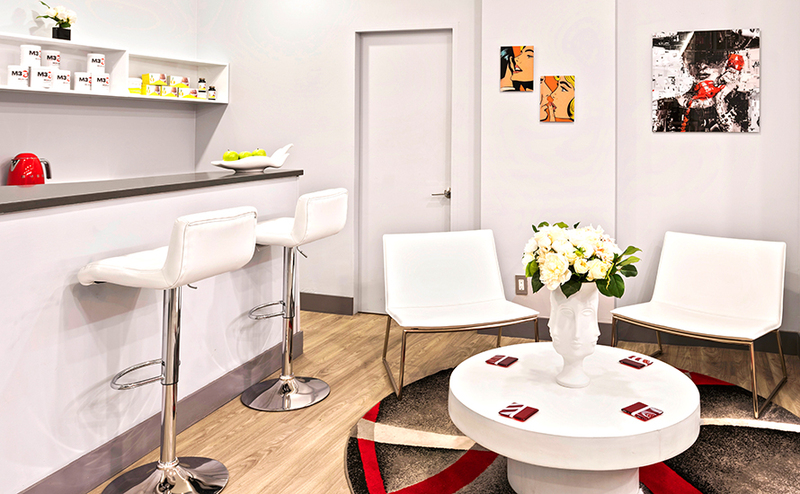 We offer everything that a spa offers in a concentrated dose. You’re in and out of the Fuel Stop in 15 minutes. WSWD: Walk us through the full Fuel Stop experience. Joura: First, you change into the gear; we give you the robe, the socks, and the shoes. You go into the pre-chamber and then the cryochamber for three minutes. When you go into the cryochamber, we put on music [of your choosing]. Even if you’re claustrophobic, it’s pleasant because the chamber is quite spacious and there is a window that you can look out of. A technician is out there, so you’re never alone. When you come out of the cryochamber, you go onto the Power Plate [a vibrating disc] for one minute just to get your circulation back. Then you do a facial-cryo for eight minutes, which is where we apply this very cold air onto your face—it’s not even touching your face, so you can have a full face of makeup. It improves circulation and gives you a glow, takes away puffiness, and makes you look like you’ve just slept for hours. In the hours following the treatment, you burn up to 800 calories because the body is still in protection mode from the extreme cold temperatures. The treatments not only give you great immediate benefits, but they are also very sustainable. The long-term benefits are that it tightens up your skin, gets rid of cellulite, your skin starts to produce more collagen, and it boosts your immune system and metabolism. We also offer vitamin IVs with a combination of all the vitamins you need injected into your bloodstream. This is a very advanced way of delivering minerals to your body; you can absorb vitamins at a higher volume and you won’t upset your stomach. We have different formulas that we use for your immune system: sports-injury recovery, energy buildup, antiaging, or jet lag. This takes about 10 minutes to do. On the way out, we have a bar where we make a shake for you. It’s called the BrainFloss. It’s a powder with choline, phosphatidylserine, DMAE, acetyl-l-carnitine, huperzine-A, amino acids, and antioxidants from green tea matcha. Its ingredients improve cognitive performance, so your mind is clear soon after you drink it. We also have a Fire Up Shot, which is made with fresh ginger juice (which we make every morning), lemon juice, BrainFloss powder, and a little bit of cayenne. WSWD: I’m from California and have never really experienced very cold conditions. What does it feel like to be in your cryochamber? Joura: When you walk into the room, you’re shocked with cold. Your mind tells you: You’re crazy, get out. But it’s a dry cold, so it doesn’t feel as excruciating as a 30-degree day in New York City. The moment you tell yourself, “I can do it,” it becomes easier. What’s interesting about it is that it sort of turns into meditation. When you are in minus-235 degrees, the only thing you do, other than listen to music, is think, “it’s cold.” Your mind switches everything else off. So you’re literally meditating for three minutes in the cold. WSWD: Do you cryo often? Joura: I do it every day. I cannot live without it. Afterward, I feel like I’ve just gone for a run. It’s this exhilarating feeling because cryotherapy brings down cortisol and elevates endorphins and dopamine. I have so much energy and focused after that I feel like I can tackle anything—meetings, family, going out, and all of that. How is that possible with our crazy New York City lifestyle?! WSWD: If you had just one hour in New York City, what would you do? Joura: I would definitely go to a Broadway show and then eat dinner at Antica Pesa…but that’s more than one hour. WSWD: What is your favorite slice of pizza in New York City? Joura: Trattoria Dell’Arte; I am at that place all the time with my kids. It is hands down the best pizza. Not only in New York City, but in the world. WSWD: What are three wishes you have for New York City? Joura: Well, one wish I have is for the city to be cleaner and more environmentally friendly—that we have less garbage on the streets and that people are aware of where they are throwing their trash. Another wish I have is about the noise; I would like to hear less drivers honking. When you go to Europe, you notice there is less noise pollution there. My third wish is that people become less stressed and take a little bit of a break. When you talk to other New Yorkers, we’re always so busy, but it helps to take a moment and breathe.